Panaji: The Diwali eve blast in Goa that killed two people - reportedly on way to plant bomb - has been formally handed over to the National Investigation Agency (NIA), police here said Thursday. Four people associated with the Hindu rightwing group Sanatan Sanstha have been arrested in connection with the Oct 16 blast in Margao. “NIA has intimated the South Goa district and sessions court on Wednesday that they have taken over the investigation of the blast which occurred on Oct 16,” police spokesperson Atmaram Deshpande told reporters. “The NIA team is expected to arrive on Monday to take over the investigation from the Goa police special investigation team (SIT),” he added. The Goa government had ordered setting up of an SIT to probe the blast case, in which two Sanatan Sanstha members died in an accidental explosion while they were ferrying detonator-rigged gelatin sticks. The SIT has already registered several cases against four members of the group who are presently in its custody. 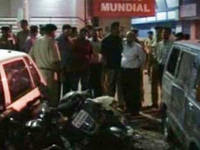 Earlier, senior police official investigating the Diwali eve blast carried out by members affiliated to the Hindu group Sanatan Sanstha (SS) in Margao, a major town in South Goa 35 km from here, said that the Oct 16 blast was aimed at targeting a public function, unlike other threats by jihadi groups received by Goa in the past. Goa, a tourist haven, has received several terror threats in the past especially from October to March, the period which attracts the most tourists to the state.